Peterson opened his 2013 season by taking his first carry of the year 78 yards for a touchdown against the Detroit Lions. Peterson struggled in the first three games of the season without all-pro fullback Jerome Felton, but upon his return in Week 4, Peterson rushed for 140 yards against the Pittsburgh Steelers. On October 10, 2013, Peterson missed practice for a "personal reason" and it was later revealed that his son was in critical condition. Peterson's son later died due to injuries suffered from an assault, apparently by the mother's live-in boyfriend. The child was two years old. Despite the loss and time spent answering relentless media inquiries, he played against the Carolina Panthers. The Panthers defeated the Vikings by a score of 35–10. On November 3, against the Dallas Cowboys, he had 140 rushing yards and a touchdown. On November 24, in a 26–26 tie with the Green Bay Packers, he had 146 rushing yards and a rushing touchdown. On December 1, against the Chicago Bears, he had 211 rushing yards in the 23–20 victory. Peterson turned in the fifth highest rushing yardage total for the season with 1,266 yards and ten touchdowns in just 14 games. He was named to his sixth career Pro Bowl as a result of his successful season. He was ranked fourth by his fellow players on the NFL Top 100 Players of 2014. 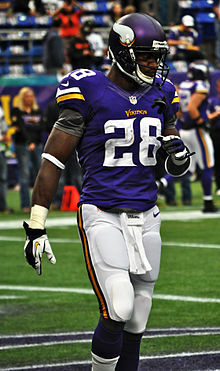 Peterson opened the 2014 season rushing for 75 yards against the St. Louis Rams. Five days later, on September 12, 2014, Peterson was indicted on child abuse charges and subsequently deactivated for Minnesota's Week 2 game against the New England Patriots. Amid the child abuse allegations, on September 15, the Vikings reinstated Peterson and he was scheduled to play against the New Orleans Saints. However, on September 17, Peterson was placed on the NFL's Exempt/Commissioner's Permission list, a similar transaction to the Restricted List, which required that Peterson was to "remain away from all team activities". After accepting a plea deal in early November, Peterson planned to return as early as week 11. On November 18, the NFL announced that Peterson would be suspended for the remainder of the 2014 season without pay. In December, his league appeal was upheld, and Peterson was scheduled for a federal court appeal hearing on February 6, 2015. Despite his tumultuous season, he was ranked 62nd by his fellow players on the NFL Top 100 Players of 2015. On February 26, 2015, Peterson was reinstated to the league after U.S. District Court Judge David Doty ruled in the NFL Players Association's lawsuit against the NFL on Peterson's behalf. Despite having only played one game in 2014, he was voted as the 62nd best player in the league by his fellow players on the NFL Top 100 Players of 2015. Peterson returned to the Vikings on June 2. Peterson struggled in his first game back, taking the ball ten times for 31 yards in a 20–3 loss to the San Francisco 49ers. He bounced to form in Week 2, picking up 134 yards on 29 carries against the Detroit Lions (the eighth 100+ yard rushing game against the Lions in his career). The Vikings rushed out to an 8-3 start, with Peterson averaging 106 rushing yards per game and breaking eight touchdowns. The period was highlighted with the game against the Oakland Raiders on November 15, in which Peterson rushed 26 times for 203 yards, including an 80-yard touchdown run. This was his sixth career 200+ yard rushing game, tying with O. J. Simpson for the most in history. Peterson struggled more down the stretch, eclipsing 100 yards only once in the final five regular season games and one playoff game. In the first quarter of a narrow loss at Arizona in Week 14, Peterson scored his 100th career touchdown. Week 17 saw the Vikings defeat the Green Bay Packers for the NFC North Division Championship. In the game, Peterson recovered a Teddy Bridgewater fumble late in regulation to help preserve the victory. Peterson was just the third player in history over the age of 30 to lead the NFL in single-season rushing yards. He finished with a league-high 327 carries for 1,485 rushing yards and 11 touchdowns. He was named as a First-Team All-Pro for the fourth time and was chosen for his seventh career Pro Bowl. He was ranked as the best running back and the fifth best player on the NFL Top 100 Players of 2016 players' list. In the Wild Card Round of the playoffs against the Seattle Seahawks, he had 45 rushing yards, 12 receiving yards, and a fumble in the narrow 10–9 loss. Peterson started the 2016 season quietly with only 31 rushing yards in a 25–16 win over the Tennessee Titans. With the Vikings playing the first ever regular season game at U.S. Bank Stadium in Week 2 against the Green Bay Packers on Sunday Night Football, Peterson rushed for 19 yards until leaving the game with an apparent right knee injury. The next day, it was revealed that the right knee had a torn meniscus. On September 22, Peterson underwent successful surgery to repair the meniscus. It was also revealed that the knee had a mild LCL sprain, but it did not need surgery. He was placed on injured reserve on September 23, 2016. On December 17, the Vikings activated Peterson to the active roster. He returned to action against the Indianapolis Colts and had six carries for 22 yards. Despite only playing three games and rushing for only 72 yards in 2016, Peterson was still ranked 98th by his peers on the NFL Top 100 Players of 2017. 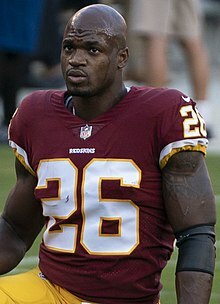 Peterson signed a one-year, veteran minimum contract with the Washington Redskins on August 20, 2018. He was signed following a number of preseason injuries to their running backs. In Washington's regular-season opener at the Arizona Cardinals on September 9, 2018, Peterson rushed for 96 yards on 26 carries and caught two passes for another 70 yards. This moved Peterson past Jim Brown to move into the top 10 on the career rushing yards list with 12,372 yards. He scored his 100th career rushing touchdown in the 24-6 win over the Cardinals, moving him into a three-way tie for seventh place on the career rushing touchdowns list. In Week 3, in a 31–17 victory over the Green Bay Packers, Peterson had 19 carries for 120 rushing yards and two rushing touchdowns. In Week 8, Peterson rushed for 149 yards on 26 carries, including a 64-yard touchdown in a 20-13 win over the New York Giants, earning him NFC Offensive Player of the Week. 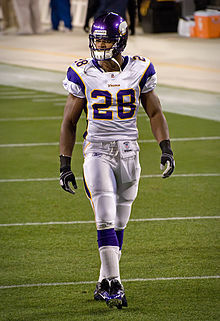 In Week 13, against the Philadelphia Eagles on Monday Night Football, Peterson recorded a career-high 90-yard rushing touchdown in the 28–13 loss. In Week 16, Peterson ran for 119 yards on 26 carries against the Tennessee Titans, bringing his total rushing yards on the season to 1,042. That performance meant Peterson passed Eric Dickerson in eighth place on the career rushing yards list with 13,318 yards. Peterson also became one of five NFL players in history aged 33 or older to rush for 1,000 yards in a season. Peterson was held to no yards on four carries in the regular season finale against the Philadelphia Eagles making his final total 1,042 rushing yards and seven rushing touchdowns on the season. ^ a b c Bensinger, Graham. "Peterson overcomes adversity, injuries to be top RB". ESPN.com. Retrieved 2019-03-18. ^ "Purple reign: Indecisive Favre signs with Vikings". ESPN.com. ESPN.com news services. August 18, 2009. Retrieved February 23, 2018. ^ Smith, Michael David (2012-12-17). "NFL morning after: Statement Sunday — or was it?". ProFootballTalk. Retrieved 2019-03-18. ^ Anderson, Karl. "Sooners in the NFL: Week 17". 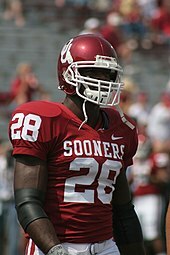 soonersports.com. Retrieved 2019-03-18. ^ "Jaylon Brown's High School Football Stats". MaxPreps.com. Retrieved 2019-03-18.